This past weekend was interrupted by a request from The Kid to go ‘abandoned house hunting’. Seems he has been collecting a few military surplus items and really wanted to go camping, but now with the overnight temperatures falling down to the 40’s, I am thinking it is a tad too cold for overnight. As a compromise, we stayed in a 4 star hotel! Now, that’s my kind of camping! This hunting trip was unusually disappointing… most of the homes we ran across had been abandoned some time ago, some were even a little too scary to go into… the biggest thing I worry about is having the floor give way on us as we explore. We did stumble onto one house that had their tornado shelter in amazingly good condition, although it seems that it had already been scavenged. It was nice to spend some one on one time with my teenager, though, and he did most of the driving. Short of that, there wasn’t much time for anything else. I did manage to coerce some small things out of the Kid in order to be able to justify the trip, like this wonderful installation in the garage. We found the cable kits at IKEA last weekend and I picked up a couple just because I knew they would come in handy somewhere. And here it was! 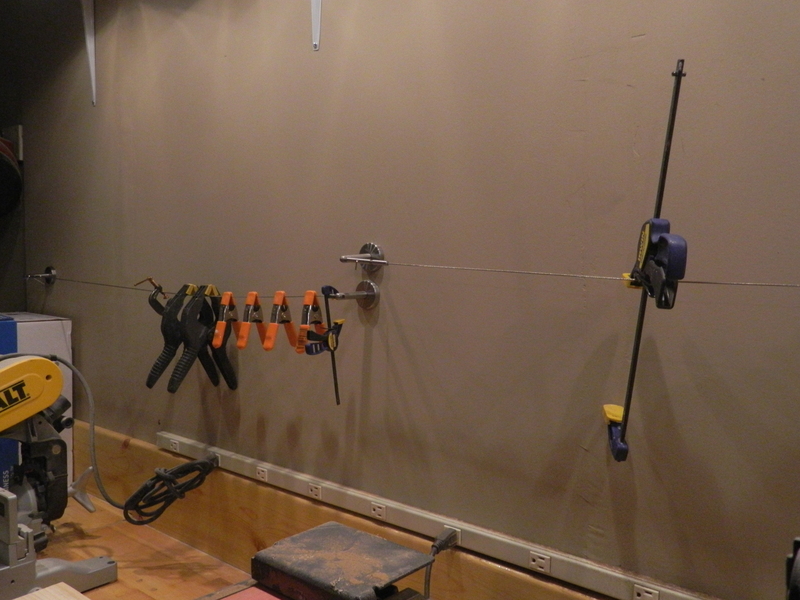 I am still stomping my feet to get everyone to put tools away after using now that we’ve completed the garage makeover, and I figure this might just make it a little bit easier. If you can just reach over and hang something, that has to be easier, right? We made the first attempt at placing beadboard into fronts of the cabinet doors for the new cabinet in my sewing/crafting room, but sadly, it just didn’t work well. The beadboard comes in these huge sheets and it was just too thick to a) get good adhesion and b) look nice. Thankfully, it was easy to pull the pieces off and clean up what little glue was left behind. I found a faux beadboard wallpaper at Home Depot (online) so, now am waiting its arrival for ‘take 2’. This is what the online ad looks like, so I am hopeful. This entire wall of cabinets already in the room have beadboard fronts, so I want this new cabinet to match. 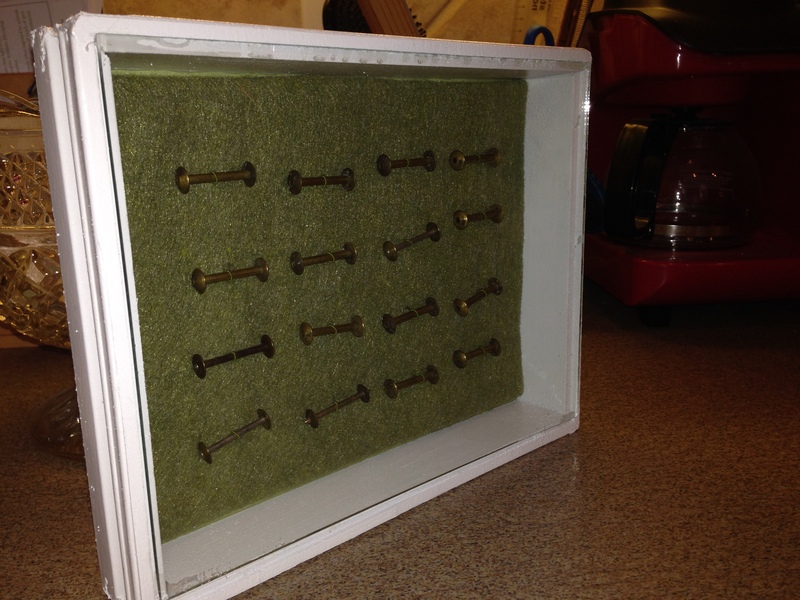 (BTW, those cabinets store 95% of my fabric stash, most still on the original fabric bolt). I love that I was able to do this when we built this house. I have also been slowly working on the two Singer featherweight sewing machines I bought via eBay. I am combining the best of the two into one working on with its beautiful bentwood case restored and varnished and poly’ed. Very close to having those done as well. I doubt that I will sew with it, what with the four other computerized machines I have, but I just love the design and simplicity of the machines and wanted to have one. Who knows, maybe after the apocalypse, it will come in handy! I love the variety of these and most of them I have no idea what they are used for. I think the one in the upper right corner was used for making/sewing ruffles. Okay! Yikes, once I got going I couldn’t stop! LOL. That’s enough for today, much to do this week in preparation for this weekend.